The Peterborough airport was put under the microscope at city hall Monday night as council was asked to consider a 20-year plan that recommends the city spend $48 million on upgrades and expansion. Airport planning consultant Adam Martin delivered a presentation looking at the future of the airport while he was quick to praise the most recent accomplishments. The city invested $7.6 million for expansion and development of lands on site, then in 2009, the federal and provincial governments provided $14 million in funding to boost infrastructure and expand the runway from 5,000 feet to 7,000 feet. That allowed larger aircrafts like Boeing 737s to land. “The investment made by city council has definitely come to fruition and created jobs and economic growth,” said Martin. He added that in the past decade he hasn’t seen growth like this at any airport in the province. 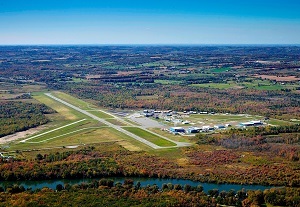 Seneca College set up its aviation school at the airport in 2014, there was significant expansion of aerospace manufacturing at Flying Colours and 27 new hangars have been built since 2008.